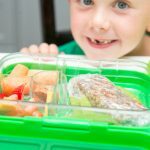 Your kids not digging green veggies? 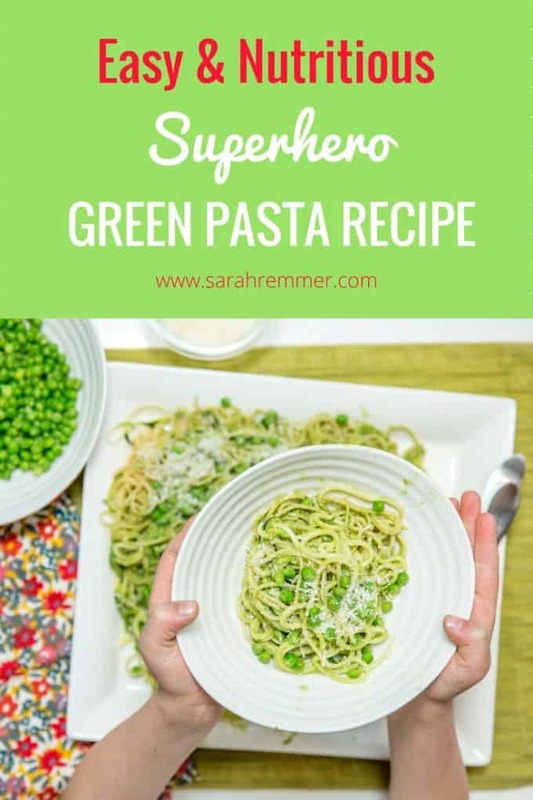 Make it fun and and involve them in making this easy and delicious superhero green pasta together! 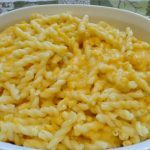 This post was written in paid partnership with my friends at Catelli Pasta. As always, opinions are my own. My kids are really good eaters for the most part. I’d love to attribute this to the fact that I’m a dietitian who specializes in kid’s nutrition, but quite honestly, I think a lot of it is just good luck! That being said, they still go through the same typical “picky eating” phases that most kids do. 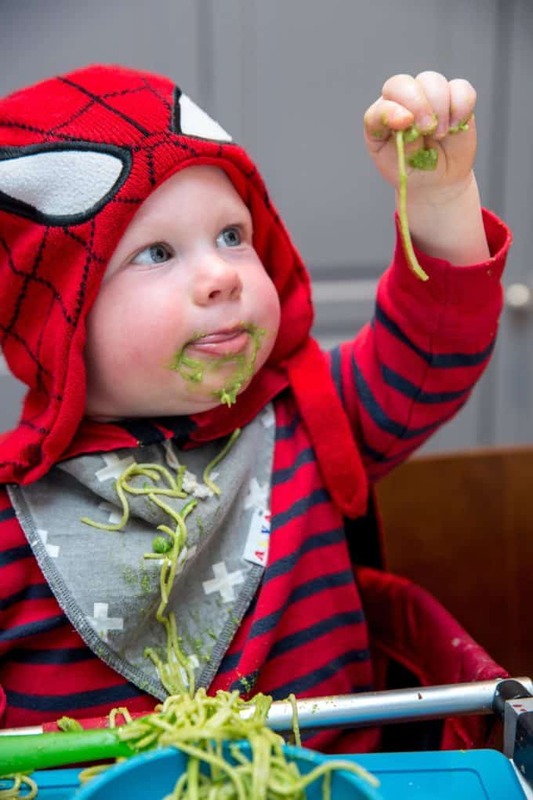 In fact, my oldest son–who has been a stellar eater up until now–has been turning his nose up to veggies lately (which I know, is completely normal!). Involving him in meal planning, and prep is key–kids are always more likely to eat something if they’ve had a hand in making it. 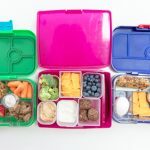 And re-introducing them over and over again, in creative, fun ways (without putting pressure on to eat them) will boost the chances of him accepting and loving those foods in his own time. 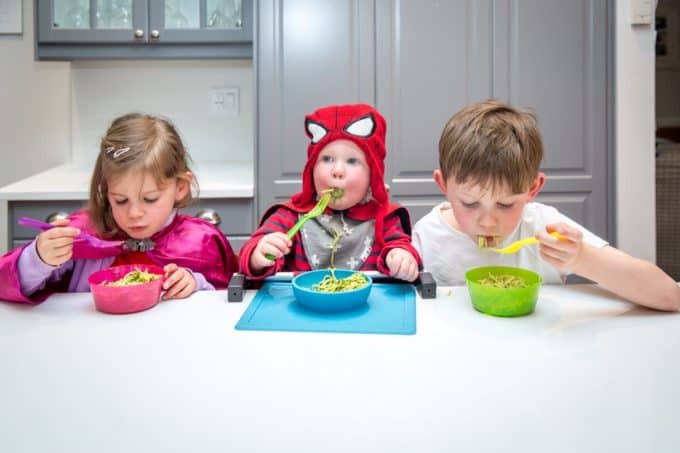 Although green veggies aren’t a typical “favourite” for most young kids, white starchy carbohydrate foods like pasta are a sure win–I know this is true for my kids anyway! Thankfully there are many nutritious varieties of pasta available now. 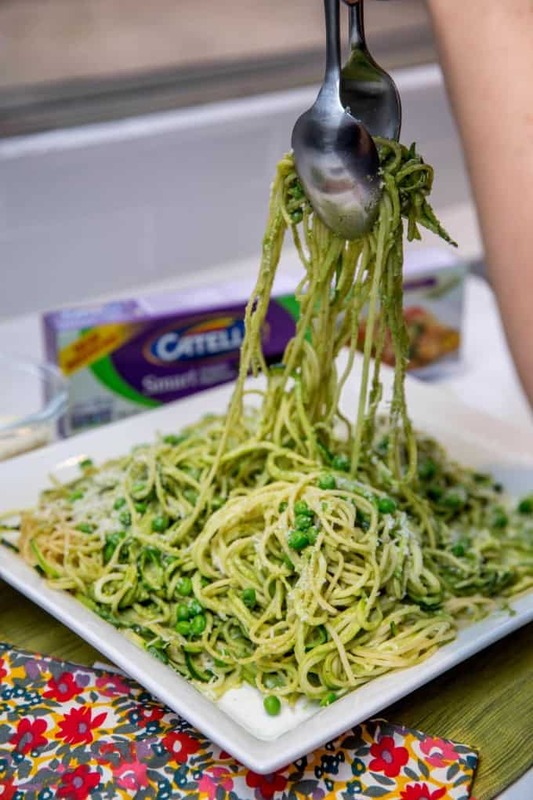 In fact, in our Superhero Green Pasta recipe we used Catelli Smart Veggie Spaghettini–a high fibre, nutrient-dense white pasta that includes oat fibre, carrots and cauliflower. A dream combination if you ask me! 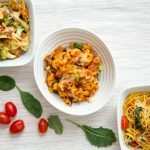 I’ve partnered with Catelli to celebrate their 150th birthday (of which they share with Canada!) in large part because they share my passion for bringing family together over nutritious, wholesome meals. 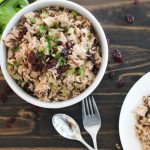 As a Dietitian, I know the benefits of preparing and eating meals together are endless. 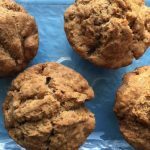 But as a busy mom of three, I also know that simple, easy-to-make recipes are key. 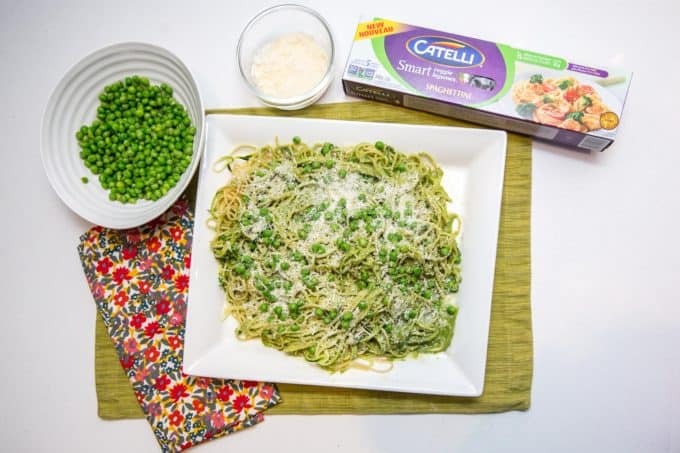 To inspire you, Catelli has created a 150th Anniversary Recipe Collection including delicious recipes created specifically for Canadian families. 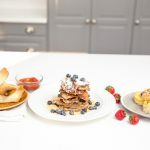 Helping my mom out in the kitchen was a big part of my childhood, and now that I have a family of my own, I love recreating those memories with my own kids, by turning those classic comfort food meals into nutritious dishes for my whole family to enjoy. 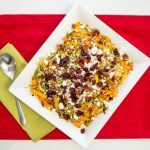 I love finding creative ways to make nutritious meals fun to prepare (and eat!). Because my kids are big into “super heroes” lately, we named this recipe “Superhero Green Pasta”. 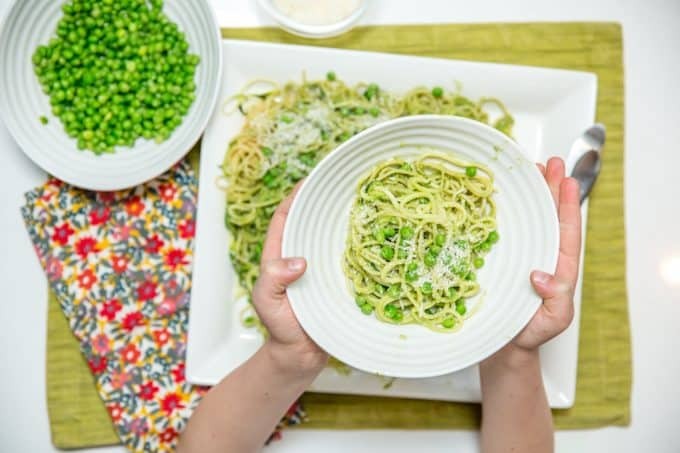 The nutrient-packed goodness of the peas, avocados, spinach, and zucchini help to give the kids “super brain and muscle power” (aka lots of fibre, essential fatty acids, protein, vitamins and minerals), and when paired with garlic, and basil pesto, deliver a creamy, delicious flavour and texture. The best part? It takes less than 30 minutes to make! Cook Spaghettini according to package directions. Drain and leave a little bit of pasta water in to keep the noodles from sticking together. I also mix a little bit of olive oil in for this reason. Rinse and dry both zucchinis and have your kids help to spiralize one of them using a spiralizer. Set aside in a medium-size bowl. Coarsely chop the second zucchini and set aside in a small bowl. Heat a large pan over medium-heat. Add the olive oil, followed by the chopped zucchini, garlic and spinach (you may have to add the spinach in batches). Saute the veggies until they are tender-crisp, bright green and fragrant. Transfer to a medium-sized bowl and set aside. Add a little bit more olive oil to the pan and add the zucchini spirals to it. Sautee for about one minute. Transfer the spirals back to the bowl and set aside. Using a good quality blender or food processor, add the cooked, chopped zucchini/spinach/garlic mixture, as well as the avocado and pesto sauce. Add warmed chicken broth until it covers about half of the ingredients in the blender or food processor. Blend until smooth, adding small amounts of chicken broth as needed. Taste-test and add salt and pepper as needed (removing some first if you’re feeding babies or young toddlers). Toss together the cooked pasta and spiralized zucchini and lay on a large serving platter. Pour sauce over top, gently toss and then add green peas before tossing again. Serve and grate some fresh parmesan on top. 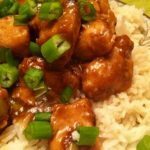 For more family-friendly, nutritious recipes, check out my Facebook page, where I share my newest posts and recipes daily! So fun! 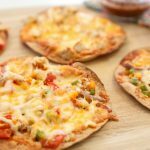 Love how quick and easy this is – perfect way to get the kiddos involved! Can’t wait to try it. Thanks Charlene!! Let me know what you think! Avocado? Check. Basil and garlic? Check. Summer squash? yes! 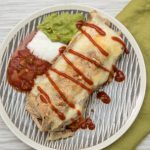 All great ingredients blended into a sauce for kids and adults who aren’t into veggies. Great idea and can’t wait to try! Thanks Bridget! And SO delicious too! 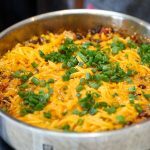 This is such a fun and delicious recipe! Love how kid friendly it is, yet can still please the whole family! Haven’t heard of this pasta before! Also, love that you called it superhero pasta. Making food fun makes all the difference to kids. Can’t wait to try this recipe! One of my kids is allergic to avocado, can you suggest any substitutes? I have fresh basil pesto, is this different than “pesto sauce”?